Phytophthora spp. pose a risk to New Zealand’s managed and natural ecosystems. As Phytophthora spp. are well adapted to aquatic environments, water surveillance can be used to identify their distribution. 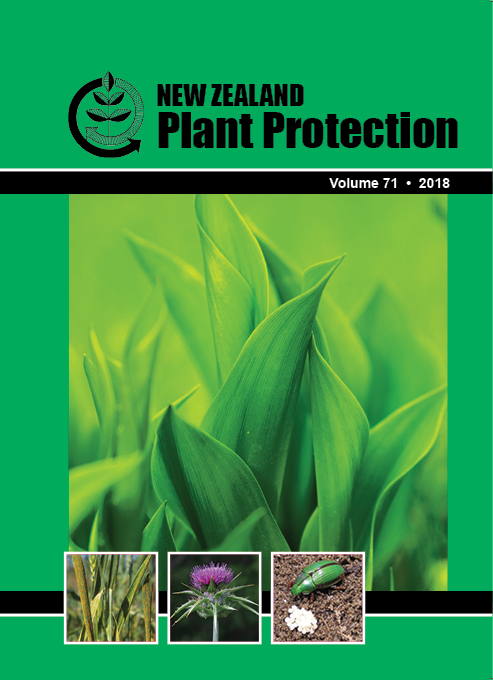 Seven bait species (Rhododendron arborescens, Pittosporum undulatum, Banksia attenuata, Camellia japonica, Pittosporum eugenioides, Pinus radiata, and Cedrus deodara) were evaluated for Phytophthora spp. isolation. Water was collected from 2 sites in the Suckling river (Tai Tapu) and half was membrane-filtered (3-Î¼m pore size) to capture spores. Leaf baits were floated directly on unfiltered water at room temperature in the laboratory for 7 days. Baits were also placed in nylon-mesh bags and floated in the Suckling river sites (in situ) for 7 days. Leaf lesions and membrane filters were cultured on Phytophthora spp. selective media. Eighty-six Phytophthora spp. isolates representing 5 colony morphotypes were recovered, 6 (3 morphotypes) from membrane filters, 25 (4 morphotypes) from baits on collected river water, and 55 (5 morphotypes) from in situ baits. The highest numbers of isolates were recovered from R. arborescens (50.6%; 4 morphotypes), Pinus radiata (17.2%; 3 morphotypes) and Pittosporum undulatum (12.6%; 2 morphotypes). In situ baiting using Rhododendron arborescens and Pinus radiata was the most effective method of isolating Phytophthora species.